We hail from a little town called Burton-on-Trent – right in the heart of the Midlands… home of Carling and Marmite! Paul and myself (Kyle) have been doing this for 8 years, don’t let our looks deceive you! Jake joined the fray two years ago in 2016 and has been keeping the beat since. THEIA came from an otherwise dreary science class in school… I heard the name whilst we were talking about the big bang theory and my imagination started running wild… the rest is history! Honesty. Whether it’s live or in the studio, we’re 100% true to being our energetic, strange selves. With so much incredible music being made around the UK and beyond at the moment we’re aware that being genuine is something your fans appreciate and want to get behind. Watching us live should be a tonic for everyday worries – we aim to come out on that stage, wherever it is and whoever is there, play our hearts out and leave you begging for more! Seeing people smiling, singing along and sharing that moment with us is a feeling that can’t be recreated anywhere else! How does it feel to be returning to Wildfire? Incredible! Exciting! You’ll be hard pushed to find a festival so loved by both the crowd attending and the bands playing! So many… you’ve spoilt us for choice with the lineup once again! If we had to pick just one, then we’re choosing our friends in Massive Wagons – we’ll be down the front with everybody else for that party! You recently hit your Pledge Music target for your third album, how does that feel? Amazing, we feel so proud that our fans believe in us to this extent – they’ve given us this euphoric relief that we can make a third album they, and we, can hold up in the air and shout about! Have you worked with Pledge before? What encouraged you to go down the crowd-funding route? This was the second time we used Pledge to help us achieve our targets for making a full-length album which as many know is a very costly and time-consuming process. It takes a lot of the pressure away from the artist in the creative stages of the album but most importantly gives us a way to give back to our fans in really unique ways that might not be possible otherwise! Having seen bands of all levels, ages and genres achieving a wide range of targets through Pledge Music, it ‘sealed the deal’ for us and gave us the motivation we needed to try it out. We’d recommend any other bands out there who aren’t sure to give it a go! You also recently made your debut album free to download. Can you tell us a bit about why you did that? Music is the only universal language (maybe…). We figured that whilst we were buried in the making of our new album The Ghost Light it would be a perfect time for those who perhaps hadn’t heard of what THEIA are all about to get involved. No pressure to buy the music and make the choice – it’s free, there’s nothing to lose and we think that people may appreciate a gesture like that. If they become a fan and continue to support the band into the future then we’ll be truly grateful. We’ve always wanted to be heard and enjoyed, by anybody and everybody who will stop to listen! Too many individual moments to pick from, it’s been a humbling journey from day one and we’ve been fortunate enough to climb higher on the circuit than we ever dreamed already! Playing at Planet Rock’s Winter’s End festival was a moment none of us will forget in a hurry… we realised just how many fans we had out there coming on this ride with us. We heard so many voices out in the crowd cheering, screaming and singing along – those are genuine emotions and reactions to our music that aren’t ‘owed’ to us, and we thank everybody who was there from the bottom of our hearts for holding a mirror up and showing us that we must be doing something right! First off – we’d absolutely have the guys from Tomorrow Is Lost kicking things off before us, they’re causing a real stir at the moment and have been an absolute pleasure to play with this year. We can’t wait to catch up with them at Wildfire this year too. 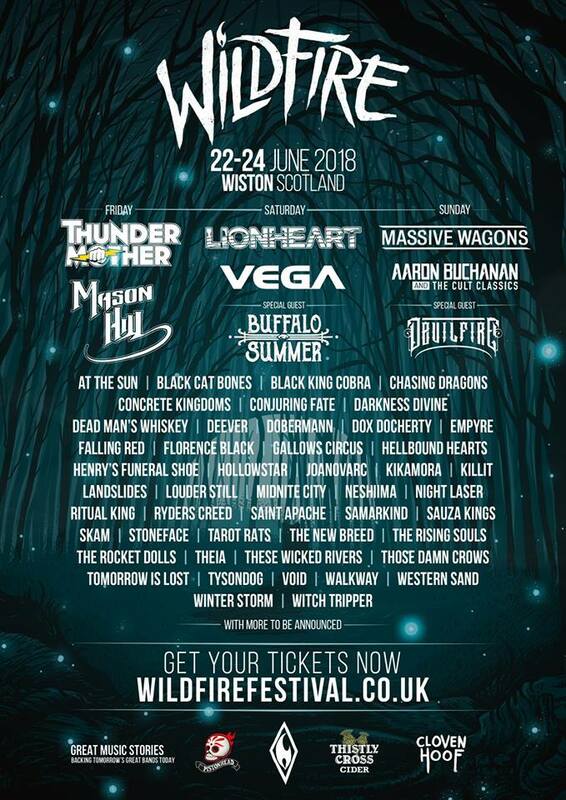 We’d be really excited to be supporting Wildfire favourites Aaron Buchanan and The Cult Classics having seen them tear apart the main stage last year! You can come and catch us on the Saturday this year – we’re not sure of time just yet! Can we take an order for all three…? If the weather’s good then we’ll have to crack open the cider!